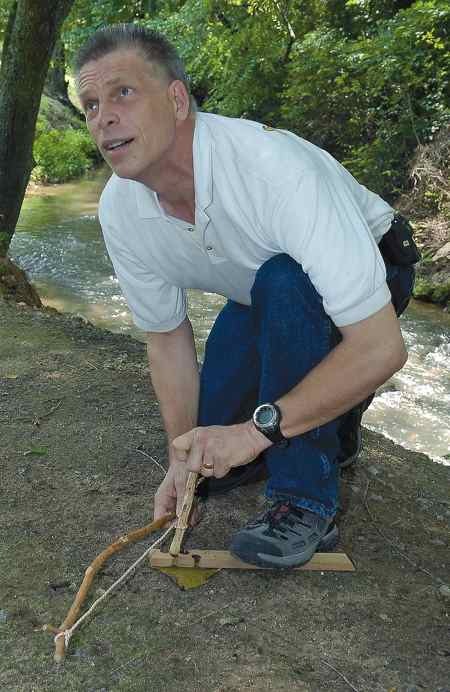 (Photo caption) Jule Hubbard/staff photo-Ken Youngquist demonstrates how to start a fire with a bow drill. Youngquist will provide a free class titled “Teaching the Ways and Means to Survive” at the W. Kerr Scott Dam and Reservoir Visitor’s Center from 9 a.m.-4 p.m. Saturday. A Wilkes County resident is carving out his own niche in the increasingly popular field of survival. He’ll share his perspective on basic survival skills in situations people are most likely to face in a free program from 9 a.m. to 4 p.m. Saturday at the W. Kerr Scott Dam and Reservoir Visitor’s Center. Titled “Teaching the Ways and Means to Survive,” the class covers critical priorities for surviving and how to use resources on hand in both urban and wilderness situations. Youngquist gave a similar but shorter program earlier this year at the Wilkes County Library in North Wilkesboro. Although he didn’t expect it, his demonstrations of firecraft, emergency shelters and other survival skills took center stage this fall at a Boy Scout camporee for troops in Wilkes, Ashe and Watauga counties. This year, he’ll conduct a two-day course for emergency personnel at the Northwest Fire and Rescue College at Wilkes Community College. The California native said he enjoys sharing and gaining knowledge in these programs and on his Survivaltek web blog (www.survivaltek.com). He started the blog about three years after moving to Wilkes in 2003 with his wife, Deborah, and their two sons, Austin, now 21, and Grayson, now 18. Youngquist’s blog entries and videos on Survivaltek.com primarily feature survival skills and tools, but he also covers more subjective topics like “Practicing Skills of Observation” and “Technomania: Has it Gone Too Far?” Plus, the blog reviews and has a growing number of survival products for sale like a plastic magnifyer for starting a fire that fits in a wallet. Survivaltek.com’s growing poplarity, especially in northern European countries, is reflected in the blog’s record of the time and origin of visits. 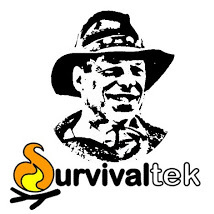 His video demonstrations of survival skills on Survivaltek.com are shared on other websites. The Survivaltek.com newsletter is available by subscription. He continued, “There is an often taught guideline that goes like this: we are limited to three minutes without air, three days without water, and 30 days without food. In cases of extreme cold we might speak in terms of hours. These guidelines help us prioritize our actions. “Escape would be the number one priority in a life threatening situation such as being involved in a plane crash or burning vehicle. Protect yourself from further danger and move to a safe area. Treat any severe injuries that were sustained. After that, finding shelter is extremely important…. “Making a fire can provide a source for signaling, warmth, and cooking. Not as immediately necessary is finding water for hydration. Once you have stabilized your conditions you can take time to assess your situation and take stock of your resources. In the short term, food can be more of a luxury than a necessity. Youngquist said his interest in nature and self reliance in the outdoors resulted from a series of lifelong events, beginning with a book on Indian lore he read when he was 8 and a grandfather from the Midwest who shared hunting stories. Although raised in urban Oakland, Calif., camping trips with a church youth organization near Kings Canyon National Park in California helped develop these interests. Simultaneously developing were his Christian faith and an appreciation of nature as God’s handiwork. After getting married and becoming a father, Youngquist helped home-school his two sons. “Through home schooling, I became Mr. Science. In the process, I came across a website on primitive living skills and that helped rekindle my interest. About that time, there was a “MacGyver “episode on TV where he (the main character) was trapped in a warehouse and started an electrical fire” to get rescued. Youngquist said he soon was getting blisters from trying to start fires with a hand drill. On the heels of that, his older son became interested in Boy Scouts and Youngquist became an assistant scoutmaster in his son’s troop. Scouting provided an avenue for development of various outdoor skills, including survival. Most recently, he has focused on the many different ways to produce fire. He confessed to being fascinated by fire and said it’s not because he’s a pyromaniac. “It’s the idea of getting something from nothing,” plus because of the importance of fire for warmth, for cooking and as a way to be found if you’re lost. Youngquist, who also works in residential maintenance, said he tries to maintain an open mind to discern where God is leading him in all areas of his life, including with learning and teaching others about survival. He said being open to God’s will ultimately has taught him to rely on God, but also the importance of preparedness and knowing what to do when the unexpected happens. Written & Hosted by PC Source, Inc.